[02:53:29] <CIA-2> EMC: 03jepler 07master * r4b4a86797513 10/configs/smithy/ (11 files): Changed eztrol plugin library version numbers in anticipation of the 2.3.5 release. [02:53:30] <CIA-2> EMC: 03jepler 07master * r61dff8e1d922 10/configs/smithy/924.ini: Fixed two typos in 924.ini. [02:53:42] <jepler> oh my goodness! [02:54:14] <jepler> ^^ I could have spent my whole evening cherry-picking these, but instead it took just seconds. [04:33:41] <seb_kuzminsky> are you and jeff having a bug squash party? [16:12:36] <cradek> seb_kuzminsky: I couldn't figure out why my build failed last night - was it just a fluke? [16:13:12] <cradek> ok good. I didn't think I could have messed up that change. [16:23:33] <seb_kuzminsky> is the prefered work flow to cherry-pick that commit from master to v2.4_branch now? [16:33:14] <jepler> seb_kuzminsky: if you make a change on master that you later decide needs to be on 2.4, the only thing to be done is cherry-pick. [16:39:10] <jepler> seb_kuzminsky: if you make a change on master that you later decide needs to be on 2.4, the only thing to be done is cherry-pick. [16:41:45] <seb_kuzminsky> is that right? [16:50:41] <jepler> does it always start with an empty git? it's no surprise that a new clone takes awhile..
[16:52:02] <cradek> this is stuck sending mail maybe? [16:53:18] <aystarik> probably the name should be changed to "zero offsets" then? [17:00:18] <aystarik> in Help screen "shift-home" means "zero G54 offset for active axis"
[17:00:54] <cradek> micges: Y is rotary? what do you mean scale change? [17:03:02] <jepler> I should have let you ask your question, sorry. [17:03:29] <micges> question is that: how can I change scale without disableing/enabling machine ? 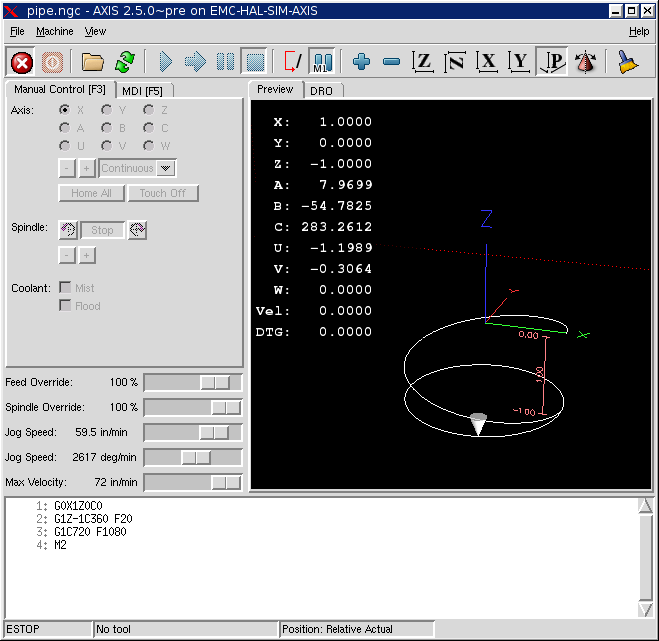 [17:09:06] <cradek> can you use your rotary as a rotary axis and just generate the gcode accordingly? [17:11:07] <cradek> I guess I don't know a good answer for you. [17:16:48] <jepler> I don't know what it would mean to do it for non-trivkins machines .. what does it mean for X to be under external control on a SCARA? [17:25:18] <cradek> how would you change cmd and fb together? I don't see how you can change the scale. [17:27:22] <jepler> what? no. you want position to jump. If you're at 1 revolution then you want to be at 300mm or 400mm depending on the pipe that is in the machine. [17:29:02] <cradek> one way or another you've got to have a controlled move don't you? [17:44:55] <micges> do you have any idea about that? [18:20:32] <seb_kuzminsky> it think it looks like "(no branch)"
[18:24:12] <jepler> why'd you choose to do git init + git fetch, instead of git clone? [18:27:08] <jepler> what version of git on that buildslave? [18:28:34] <seb_kuzminsky> 1.7.0 is available, do you think that'd help? [18:37:33] <seb_kuzminsky> is that better than giving update-dch a branch name as an optional argument, and have it pick tags appropriate for that branch without messing with the repo? [18:38:04] <jepler> maybe what you should give update-dch is the pattern? I dunno..
[18:40:39] <micges> without A, is it spelling error or intentionally? [19:14:00] <jepler> if you want the axes to be X and A then I think you want GEOMETRY=AXZ and set Z=1 so that rotation actually does something. [19:57:46] <jepler> I just fixed an i2g bug this year. can't it wait for 2012? [21:35:07] <skunkworks_> Hungry hippo.. wait - that is taken. [21:59:44] <seb_kuzminsky> three virtual build slaves stuck in "git fetch"
[22:01:15] <seb_kuzminsky> one's doing an actual download of the repo (starting from "git init") so maybe it's using up the git server's outgoing bandwidth? [22:01:57] <cradek> how long have they been going? [22:11:19] <cradek> ping times are back to normal - it must be done. [22:12:53] <seb_kuzminsky> is the git server in your house? [22:16:57] <cradek> hey, it's after 4 on a friday. why am I here? [23:54:15] <jepler> darn, seb_kuzminsky left. I was just about to tell him I have a BIT file that makes the hostmot2 driver oops during registration!